My beautiful 12 year old daughter made this for me and put it on my office wall. What an epic quote and thoughtfulness from a 12 year old. So if you feel like life is pulling you back…maybe it is just getting you ready for a big launch? I have experienced the pull back of life after experiencing a Mack Truck with a business. However like this beautiful quote has said “..it means its going to launch you into something great.” Boy was that such an accurate statement. The bow of life had decided it was time to launch me in a new direction (target) and to get me to surrender to this, it needed to give me a wake up call! All this is well and good, but the last sentence is the REAL GOLD. 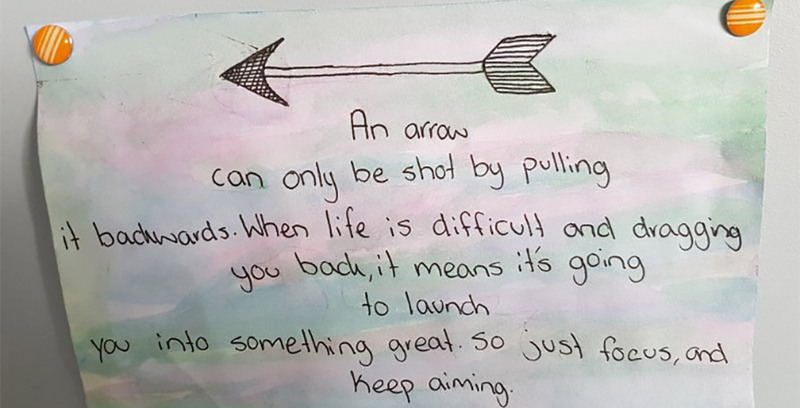 “So just focus and keep aiming.” You maybe ready to launch but if you don’t have a target to aim at you will end up lost in the grass somewhere miles from any target. Aiming for a bulls eye will at least get you a result! 1. If you feel like your business is ready to launch but are feeling stuck. Contact me to arrange a free session (chat) about what the blockage for you is. 2. If you are feeling like things need to change, don’t know where the target has got to then attend a 3 day Advance (More info here).